Want to know more of personal survival skills and how to rescue others? Want to be a lifeguard and entry to professions like swimming and lifesaving coach? 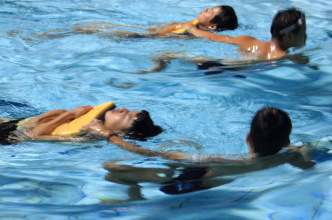 Lifesaving 123 is to provide an introduction to lifesaving and to develop an initial appreciation of water safety, rescue and resuscitation skills. to improve trainee's knowledge and skills in lifesaving preparatory to the Standard Module. Must be able to swim at least 200 meters in breaststroke or any other recognisable strokes. B. Casualty simulated - Weak-swimmer, Non-swimmer, Injured swimmer and Unconscious swimmer. C. Reaching, Wading, Throwing and Accompanied Rescues. D. Entries - Shallow and Deep water entries. F. Resuscitation - Expired Air Resuscitation, Resuscitation on land and in water. G. Surface Dive and Underwater Swim. Pre-requisite: Successfully completed the Preliminary Module or equivalent. A. Skills covered in Preliminary Module. B. Unaided Landing of victim. G. Distance towing with timing. Are you worried about your child while they are playing in the water? Is your child looking for some exercise? Water activities are fun, but there are dangers associated with it. 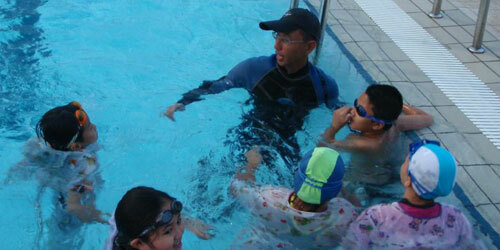 By equipping your child with swimming skills, it allows your child to play in a safer water condition. Our swimming lessons are programmed to allow your kids to learn from basic water confidence to different swimming strokes. They will also participate in Singapore Sports Council certifications of Swimsafer Bronze, Silver, Gold and Award as well as Survival awards by STA that are recognized by all schools in Singapore. Are you afraid of the waters and scared to swim? Do you feel that you can’t move in the waters? We can help you. We have taught many students from basic water confidence to overcome their fear to be able to Swim both freestyle and breaststroke. We specialize in coaching techniques for the adults to provide a clear breakdown of strokes to allow you to swim with ease. This help to empower you and allow you to swim with ease and complete task that you never think of. Our lessons cater to individual needs and provide attention to you.